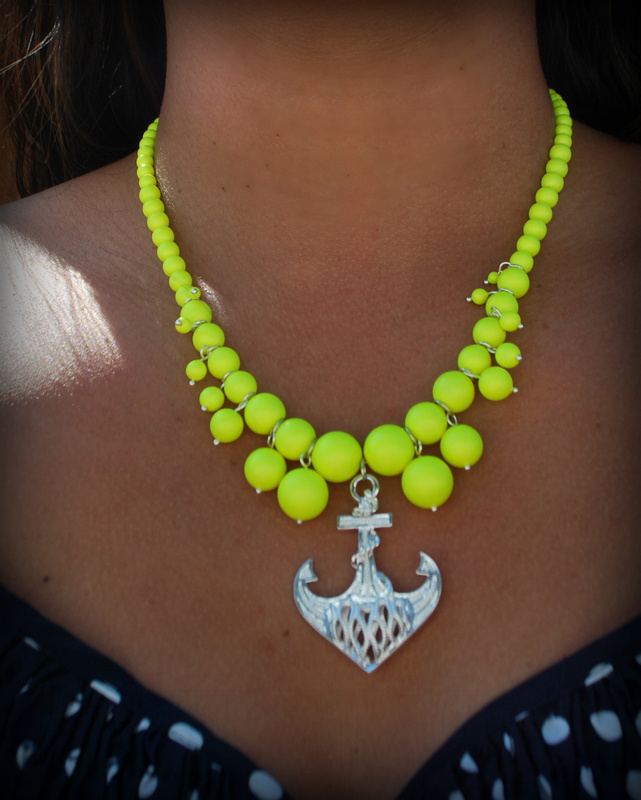 When we first got these amazing neon SWAROVSKI ELEMENTS pearls in stock about a month ago I fell in love. Having been inspired by Pinterest and recent fashion mags, I couldn’t wait to create something bright and summery. And when I saw these new filigree pendants, I knew exactly what I wanted to do. While this isn’t exactly what I had in mind when I set out to do this project, I am thrilled with how it turned out. The pearls have a really nice, almost matte, finish and the weight of the crystal make it really nice to wear. The largest bead on this necklace is a 12mm and the smallest is a 3mm. I finished with a TierraCast toggle clasp in a matching silver finish. 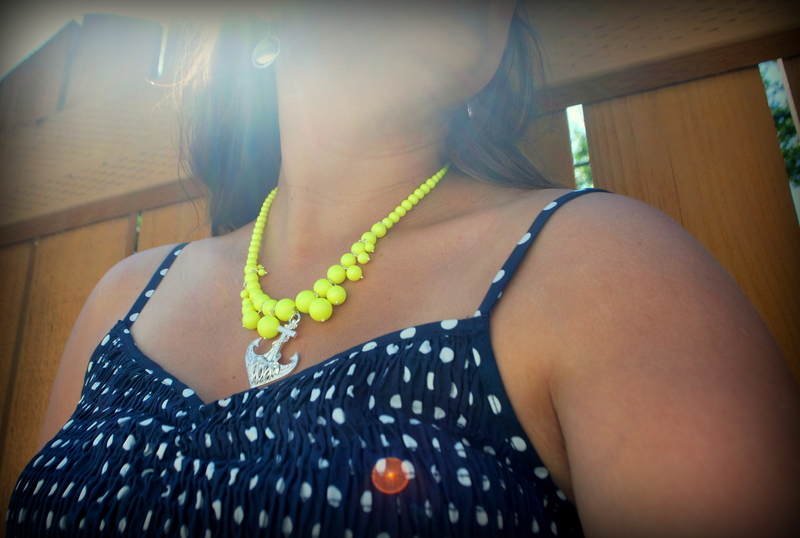 The bright pop of yellow when paired with a navy blue is reminiscent of summer days on the beach. Bright sun on blue water. 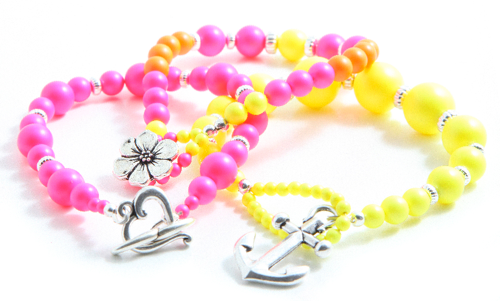 While I was at it, I picked up some of the pink and orange pearls and whipped up a few fun bracelets. My favorite bracelet of the bunch is the all yellow one. Instead of using as traditional clasp (or button, as I did on the center bracelet shown above) I used this really cute TierraCast anchor charm. 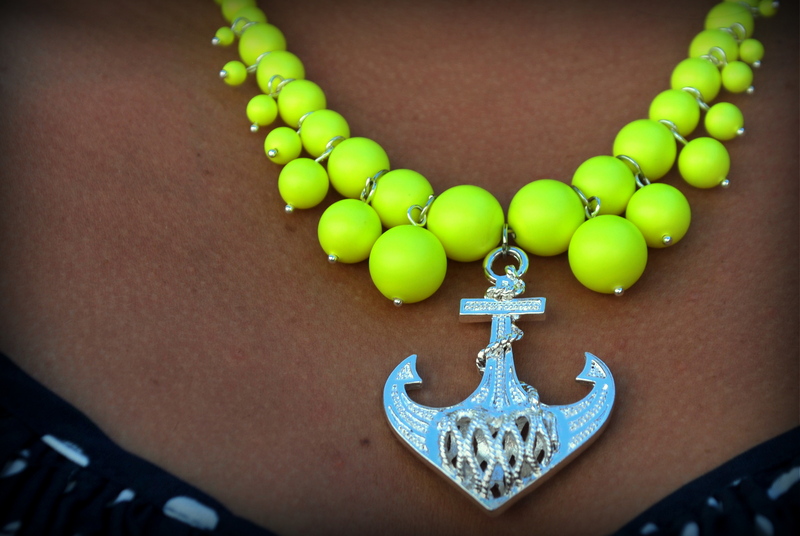 The prongs of the anchor hook onto the beaded loop for a creative twist. I used wire guardians, crimp tubes, and crimp covers to finish off each piece. I really enjoy working with the wire guardians and crimp covers because it gives the jewelry a really polished look. Check out our YouTube channel and this video for a quick tutorial on how to use a crimp cover! And of course, it wouldn’t be a matched set without a pair of earrings! Click here for a tutorial for each of the projects shown in this post. And if you act now, you can save 15% on all the items used!